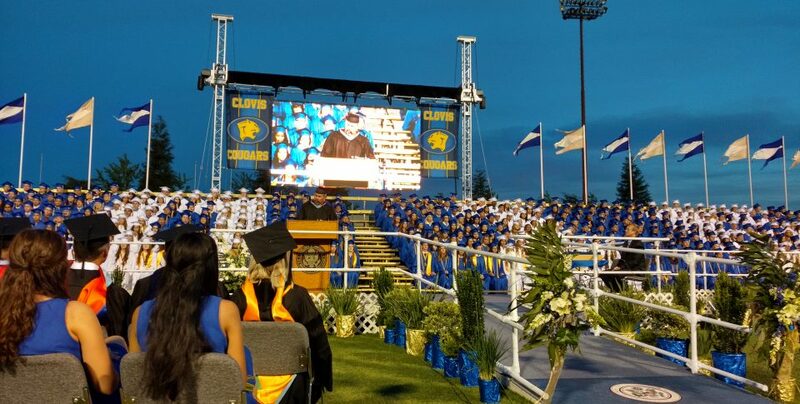 Clovis has a long history and tradition of passionate teachers, administrators, employees, and parents committed to delivering on high standards for Clovis schools. We believe in upholding those high standards, as set in motion by Floyd “Doc” Buchanan to maintain a standard of excellence. We believe that integrity cannot be compromised. We believe in collaboration based on shared decision making and trust. We believe that standing together with our students, employees and community is our strength. A fair break for every kid. Educate the whole child in Mind, Body and Spirit. Base all decisions on what is best for students’ academic, social and emotional well-being. It’s people, not programs, that make the positive difference for students. Foster a climate of trust and respect through relationships and communication. Collaborate and empower all employees in the decision-making process at the site, Area and department level. Be accountable to high standards, both individually and collectively. Surround students with the very best role models and mentors. Support life-long learning by providing ongoing professional development for all employees. Education revolves around teamwork and trust. Great schools build great communities and great communities build great schools. Engage with parents and the community to support ALL students. Recognize the cultural perspectives of our community. Be accessible to parents and the community as we continue to grow. When you do something only do it first class. Provide safe, student-centered, world-class schools. Build state-of-the-art facilities that promote student success. Maintain quality campuses that create community pride. Design learning environments that serve ALL students now and in the future.